The sources of pain are not always found in the area where the pain seems to be radiating from. This is clinically called referred pain. The distancing of the pain sensation from its source can make treatment more difficult. 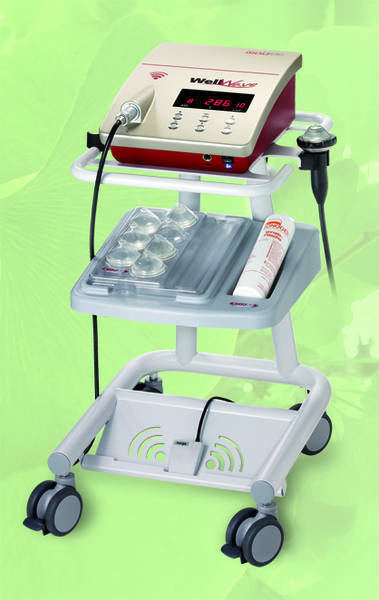 Diagnosis of referred pain and the recognition of the originating pain triggering points can be accomplished using the WellWave. Abnormal musculoskeletal tissue can be “flared” with focused ACT in order to define the areas that require treatment. This process of defining the origins of pain is guided by the patient through verbal feedback to the healthcare professional providing the treatment. 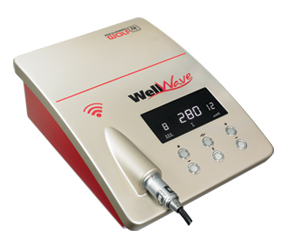 What conditions can be treated with a Well Wave Machine? Studies show that not only is this therapy effective, it's also safe for patients. Researchers have found that between 65-95% of patients see a reduction in pain after this therapy. Are there known side-effects of Acoustic Compression TherapyTM? Treatment side-effects are limited to reddened skin and/or minor soreness at the treatment site. Your clinician will identify the treatment site or sites. They may mark these sites. The clinician will start the treatment at a very low output setting and increase the power to a level that you help define and is best suited for your condition. The output level and acoustic wave frequency rate may vary from location to location based on the depth and type of tissue being treated. As the clinician moves the therapy source around the treatment area, you may feel a deep, dull ache that is familiar to you as being like the feeling your condition produces. The clinician will ask you to report when you feel the ache and will adjust the output of the device to the appropriate level for your treatment. They may also ask you to confirm that the therapy source is still creating the ache and may adjust the location of the treatment based on your feedback. If at anytime the treatment becomes uncomfortable, mention this to the clinician and they will adjust the output level.